Hip labrum is a cartilaginous membrane lining the socket of the hip joint. Labrum serves many functions where it acts as shock absorber, lubricates the joint, and distributes the pressure equally. It provides cushioning support to the joint. 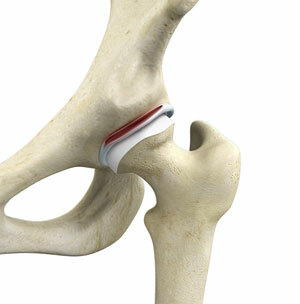 It also deepens the socket and helps to stabilize the joint. It holds the head of the femur in place and prevents the lateral and vertical movement of the femur head within the joint. It also deepens the acetabular cavity and offers stability against femoral head translation. Dr. Patel may start with conservative treatment prescribing nonsteroidal anti-inflammatory drugs and advising you to rest. These methods may offer symptomatic relief while surgery is required to repair the torn labrum. Dr. Patel may perform arthroscopic surgery using fibre-optic camera and surgical instruments through the smaller incisions. Depending on the severity of tear, the damaged or torn labrum may be removed or may be sutured.